Home › Fleet Feet Sarasota Blog › We're Moving! Fleet Feet Sports Sarasota Is On the Move! SARASOTA, Fla. (February 6, 2015) - For more than a decade, Molly and David Jackson have been committed to Sarasota’s running and fitness community. When the opportunity arose to move their Fleet Feet Sarasota store to a larger space, they leaped at the chance. Actually, they only had to hop, as it’s less than a mile from their current space. The new location is 711 S. Osprey Avenue, Suite 1, across from P.F. Chang’s and next to Word of Mouth. It will be open Feb. 20th. The Jacksons also own and operate New Balance Sarasota, New Balance University Park and Molly’s! A Chic and Unique Boutique. The couple serves on a variety of Boards and are active in numerous charitable organizations. Their most recent event, Sarasota Music Half Marathon held Feb.8th, raised more than $25,000 for 20 local non-profits. They are firm believers in giving back. When the Jacksons purchased the Fleet Feet franchise more than four years ago, they knew it was a perfect fit. The store’s mission is to inspire people through education and training to lead a more active, healthy and fun lifestyle. Helping individuals find the right “FIT” in every facet of their lifestyle was their vision. Thursday, Feb. 19 at 6pm: Manasota Track Club Fun Run. Run from the new location to the old location and help Fleet Feet Sports Sarasota lighten their load. Runners will grab boxes to carry back to the new location and be rewarded with food, giveaways and beer. Free. Saturday, March 28: New Location Celebration with vendor demos, games, entertainment, and prizes for the whole family. 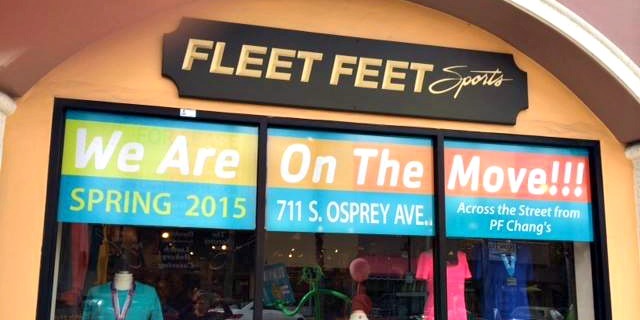 Starting Feb. 20th, guests can visit the new Fleet Feet Sports Sarasota location at 711 S. Osprey Avenue. New store hours are Monday - Friday 10am - 8pm, Saturdays 8am - 8pm and Sundays 11am - 6pm.